Qatar Airways discount: Save 10% via mobile in Economy and Business! Qatar Airways discount: Save 10% via mobile in Economy and Business! 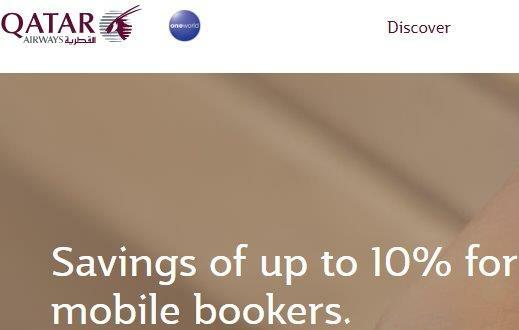 5* Qatar Airways have released another promotion this time you can save up to 10% via mobile devices. This should work from all European origins to all destinations. (Except Doha as a final destination). There are some other exceptions when you can not apply this discount. Simply follow below link to read complete conditions o this Qatar Airways promotion). Offer applies exclusively for bookings made on mobile devices in Economy and Business Class. As usually only base fare is discounted. Does not affect any additional services as well as taxes and fees. All you need to do is follow below link to check all the details then make your booking via mobile device. Your flight should be automatically discounted compared to standard fares. Qatar Airways discount offer is running till 8th of July 2018. Travel period is then from now untill 9th of December 2018. Offer valid on Qatar Airways operated flights only. (Discount does not work for codeshare flights). Further conditions min / max stay and changes / cancellations depends on your selected class and route. Qatar Airways promotion may vary slightly by selected origin. Just check out below special link and chance your country of origin to what you prefer..You can check other Qatar Airways discount codes in this article. Qatar Airways are offering its service to most of main European markets such as Ireland, United Kingdom, France, The Netherlands, Belgium. Germany, Italy, Spain, Scandinavian countries as well as countries in Eastern Europe. Take advantage of this latest Qatar Airways promotion and save easily save decent money with this latest discoun offer!